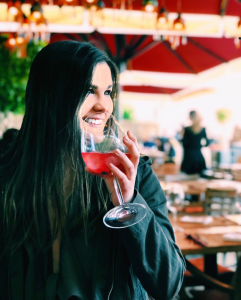 Recently we caught up with SAI Ambassador Grace, who studied abroad in Florence during the spring 2018 semester. In this blog entry, she answers some questions describing her time in Florence. 1. What felt the most “foreign” to you when you came back to the U.S? The toilets in Europe you push the top of them to make them flush. I swear I should of gotten a top flush toilet sent from Europe because of the amount of times I pushed the top when I got back to America. Driving a car is another story. Who knew that being away from your car for four months could cause such chaos. Stop signs and red lights were the most foreign thing to me I completely forgot that when they show up you have to stop. It’s funny how used to something you get and then when you get back to normal it doesn’t feel normal anymore. I studied abroad in Florence, Italy so we didn’t have many food options, it was mostly pasta. When I got back home, I realized how much I missed salad and green vegetables. We did not have dryers and the washers are so tiny. I finally got used to hanging my clothes right before we had to leave. When I got back a dryer felt so weird to have. 2. What was your favorite class abroad and why? My favorite class abroad was my yoga and meditation class. The first day I walked into the class I knew it was going to be an experience. My teacher was an easy going guy who was very much of a so-called Yogi. He wore the same garnet sweatpants and grey sweatshirt every class. Every day we would start our hour long yoga routine with child’s pose, my favorite. We would then proceed to our whole routine and after an hour or so we would continue with a lecture. The lectures we not normal lectures. They involved a lot of student participation and interaction. We were taught to think deep and get out of our comfort zone. We learned all about meditation, feelings, and why we do the things we do. We got to go on a field trip to a local yoga studio where I did my first headstand ever. This class was the perfect class to take while abroad because it felt like a piece of home. It also allowed me to have moments of deep reflection and meditation on my whole experience while abroad. 3. What advice do you have for new study abroad students? The main thing I learned abroad was the importance of budgeting. Everyone will tell you to budget before you go but I never knew how real it was until I got to the last dollar I owned halfway through my stay and thought to myself “uh oh.” Honestly, double the amount of how much you think you are going to need. There’s no bad in coming back with extra that you did not spend. I thought I had saved so much and didn’t realize how fast it goes while you are abroad. While traveling a ton of unplanned expenses come up. Also you have those times when you might just mess up. Coming from someone who had a couple of oops while being abroad (booking a trip for the wrong weekend without getting a refund and having a flight canceled) take my word for it. Another piece of advice that I think is so important is stay in your apartment as little as possible. Always try new things and new places. Even if it is cold outside go to a café or grab a glass of wine you never know who you may meet. Lastly, try to meet as many new people as possible! I had a lot of people that I came over with from my university at home but I made it my mission to meet other people from other schools and hangout mostly with them. Now I have amazing memories with people all over the nation. That is something I am most proud of. 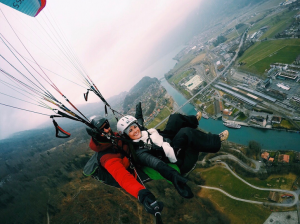 Paragliding in Interlaken, Switzerland was one of the best experiences in my life. 4. 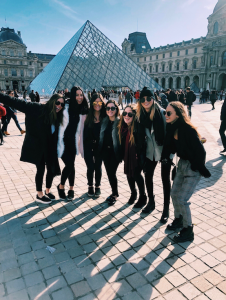 What is your favorite memory from studying abroad? 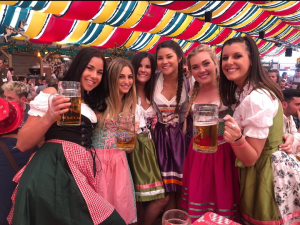 My favorite memory from studying abroad would definitely have to be going to Springfest in Munich, Germany. Despite how terrible I looked in a dirndl I had such a fun time. The best part is that we all looked ridiculous for three days straight in our dirndls. The weekend was filled with great friends, beer, pretzels and carnival rides. The beer steins were so heavy that I actually got a bruise on my hand from holding it all day long. The music was awesome in the big tents and I got to meet up with so many of my friends from home studying abroad in other countries. That weekend we also got to go to the Dachau Concentration Camp. That was very moving to go to and see. I have always learned about it in history class but actually seeing it in person was an experience I will always remember. 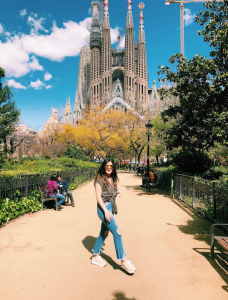 Grace was a spring 2018 SAI Florence student. She is also an SAI Ambassador.